Yes, I skipped a week of The Great British Bake Off technical challenges. A real diva of a cake, ‘Prinsesstårta’, or ‘Swedish Princess cake’, proved beyond my budget for the week – too many ground almonds needed for the marzipan. I may re-visit it at a later date when I have an occasion to bake for as it does look delicious, layers of light sponge, jam, crème pâtissière, whipped cream and then a layer of marzipan over the top to make a magnificent dome-shaped cake. Mmmm. 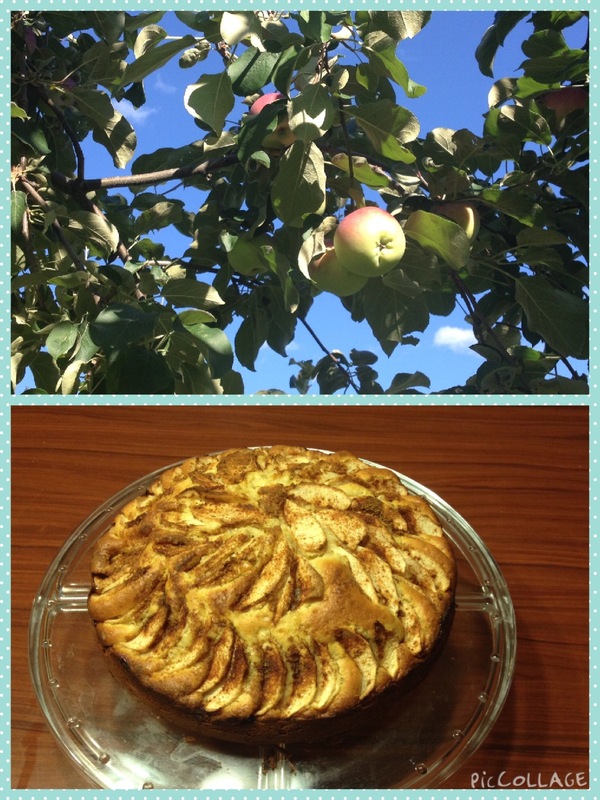 However, as there are lots of apples around at this time of year I did make an Italian Apple Pie (Nigella’s recipe says pie so who’s to argue) as my contribution to European cakes week. I do love apple-picking time. I was and still am occupied with other concerns too, not least preparing a talk on justice and human trafficking for our upcoming Women’s Retreat. Time is ticking by like a countdown to the weekend and any day off or spare time I have during the day is spent reading, researching, writing up my notes and praying about it. It is exciting to be a part of the team doing the talks for the weekend – scary but exciting. It’s a good thing I have to work and have arranged to meet some people for coffee and such so that I have time away from doing it – otherwise I am tempted to cut myself off from civilisation and become buried in information, and that is hardly the point given the subject matter. Out there is what it is all about. After that weekend, I’ll have to catch up with the housework and other jobs I’ve left on the back burner in order to get it done. Every time I have to prepare a talk it gives me a renewed appreciation for the time leaders put into preparing sermons week in and week out. Respect. Seriously, a lot of respect. So, onto this week’s bake-off. Another pastry week! The bakers made pastry parcels for their signature bakes – mini Beef Wellingtons, pasties, samosas, and lots of yummy éclairs for their showstoppers. Like the bakers on the programme, I had never heard of the technical challenge. 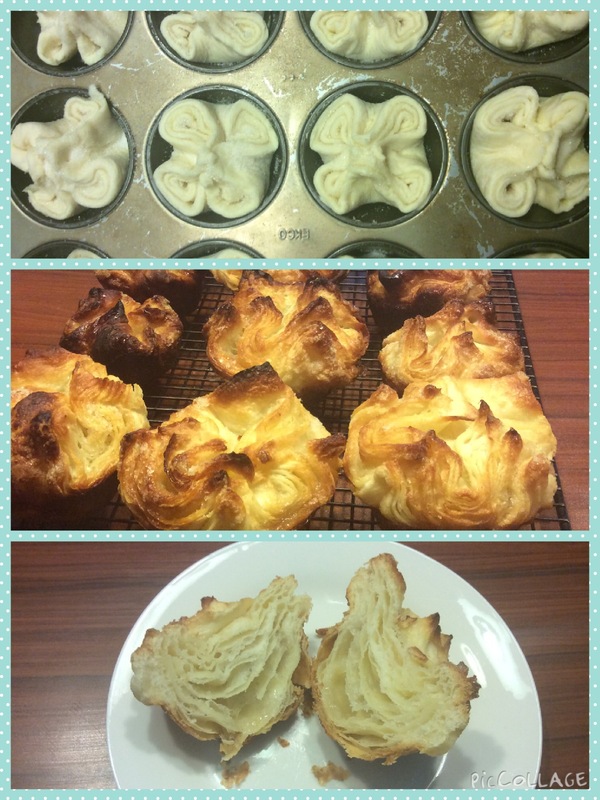 Kouign amann. It’s a Breton cake, originating from Brittany, France in the 1800s, made of a yeast dough with layers of butter and sugar which is made a bit like a flaky pastry. As it cooks it puffs up and the sugar caramelizes. While I was watching I was working out how early I’d have to get up on Thursday morning in order to bake them before I was due to meet my friends for coffee at 10am. There’s a lot of rolling, folding and chilling. I set my alarm for 5.20am. I liked this bake. It’s not too expensive to make (I didn’t have to go out and buy any of the ingredients), and there’s something satisfying about the process. Preparation and Patience. Everyone else in the house did not appreciate me bashing chilled butter with a rolling-pin at 5.45am in the morning, something I hadn’t considered, so I suggest rolling out the butter and chilling it the night before if you decide to make this in the early hours. The end result tastes like a sweet croissant and are best eaten fresh. Next time I make it I think I’ll try popping a square of dark chocolate in the middle of the square before gathering the corners in to make something like a pain au chocolat, but they are lovely as they are. The caramelized sugar did catch a bit on mine – I should have covered them earlier or maybe I’ll lower the temperature slightly next time. The coffee date I went on was at the lovely Chess Piece Pâtisserie and Café in Fredericton. I went to say goodbye to a dear friend of ours, Sally, who flew back to the UK this very weekend. Our family along with many others will miss her loads, but we’re excited for all that God has got in store for her back in Blighty. A fresh, new chapter. Now, back to that prep…and maybe some apple-picking. Previous Post Mini Pear Pies, Oh My!